WINTER HAVEN, Fla.—The two-day Chain of Lakes Cycling Classic wrapped up is sixth successful event Sunday evening with the Pro1/2 Criterium race on the 8-turn, 0.75-course around downtown Winter Haven. After 48 hard laps which saw a six-man breakaway lap the field and chase down a late escapee to set up a sprint finish, it was Jake Silverberg of the Interactive Metronome Development team who crossed the line first by a margin of 0.424 seconds. 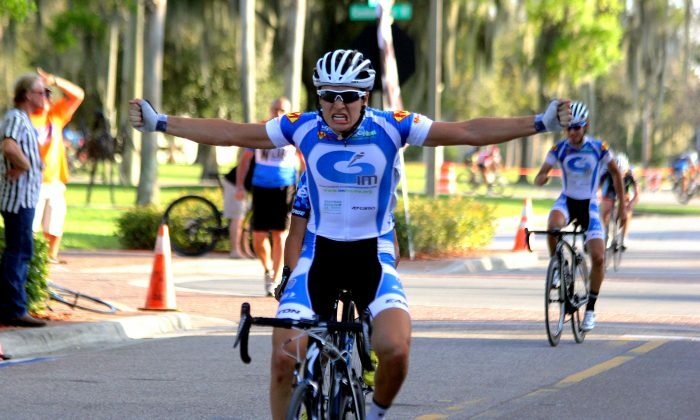 Silverberg, a 17-year-old from Pembroke Pines, beat a field of 31 riders, most with much more experience. He credited the win to his team’s strategy and preparation. Silverberg and his four teammates waited until the right riders got into a breakaway, then pushed the pace to lap the field by the last quarter of the eighty-minute race. From there, Silverberg said, “Everyone knew what the game plan was; we got back into the field and one of my teammates, Sebastian Morfin, led me out perfectly for the last lap and we were successful. Silverberg is more than just a sprinter. He finished fourth in Saturdays’ 70-mile road race (which was won by teammate Sebastian Morfin) and second in the seven-mile time trial Saturday afternoon. Starting in June, Silverberg’s teammates will have to do without him; the talented teen will be heading to Belgium to race with the Omega Pharma-Quickstep development squad through the summer. This will be a huge opportunity for Silverberg: OPQS is a powerful UCI WorldTour team featuring world-champions Mark Cavendish and Tony Martin, arguably the best sprinter and time-trialer in the sport today.